Introducing Katie Thiroux – a bassist and vocalist of outstanding talent and determination. She provides in-the-pocket, full-bodied bass lines, warm and inviting vocals that demonstrate a real understanding of a lyricist’s intent, and original compositions that place her firmly in the Jazz tradition. A KUVO 30 under 30 sponsored event. Katie’s stellar new record “Introducing” is receiving notices from Jazz reviewers around the globe, appearing at Baur’s – in Denver for the first time – presented by your Music Appreciation Society. Coming from a musical family in Los Angeles, Katie was surrounded by music; beginning with violin lessons at age 4, and then acoustic bass at age 8. While continuing her studies on bass, Katie explored both Jazz and Classical vocal styles; landing principal roles in the LA Opera and Opera Pacifica by the age of 10. Captivated by an early recording of Lionel Hampton, Katie was driven to pursue her love for jazz and began studying privately with jazz vocalist Tierney Sutton at the age of 12. 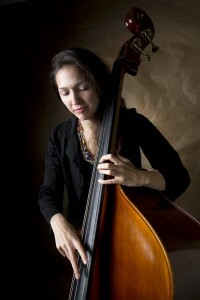 In 2005 Thiroux began a mentorship with John Clayton that started at the Vail Jazz Party and later that year she received the Shelly Manne New Talent Award, from Los Angeles Jazz Society In 2006 was awarded the Phil Ramone Presidential Scholarship to Berklee College of Music Upon graduation, Thiroux was asked to teach at the Berklee International School in Ecuador, Quito. Having performed at jazz festivals in the United States, Mexico, Germany, Finland, Serbia and Singapore as both a leader and a sideman, Thiroux often incorporates workshops for students and audiences. It is her passionate belief that exposure to Jazz history, culture and styles is vital in keeping the music alive and thriving. 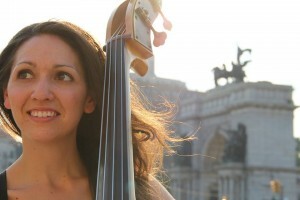 In addition to work with her Quartet, Katie is touring with pianist Larry Fuller, and is heard with trumpeter Brian Lynch, guitarist Mundell Lowe, drummer Lewis Nash, and vocalist Niki Harris. Katie’s swinging bass, clear vocals and inspired instrumental arrangements are reflective of her musical idols: Ray Brown, Oscar Peterson, Chet Baker and Anita O’Day. Katie Thiroux’s knowledge, perseverance and fervor for the music make her a rising force in today’s scene. This is a rare opportunity to witness a rising star in the magical and intimate setting of Baur’s Listening Lounge. Get your tickets to this wonderful artist now!